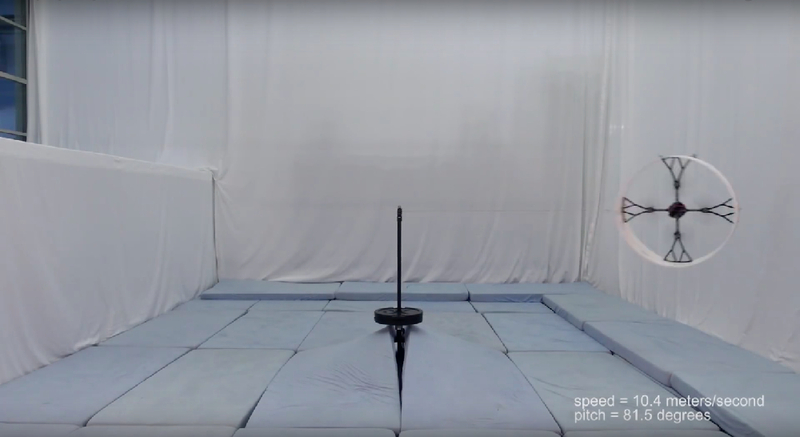 The Flying Ring is a new flying vehicle being developed at the Institute for Dynamic Systems and Control, ETH Zurich. The goal of the project is to fully characterize all aerodynamic properties of the vehicle. While traditional quadcopters are agile and carry high payloads they are not efficient in forward flight, with traditional lift to drag ratios comparable to a fruit fly. 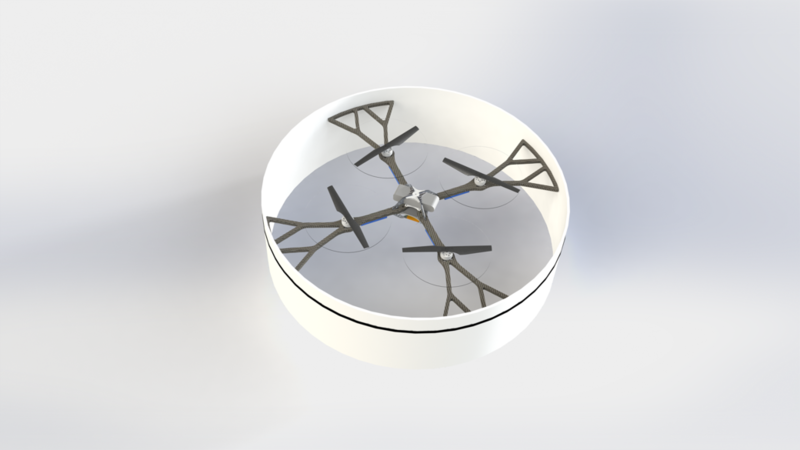 The Flying Ring vehicle, however, can fly on its side, allowing the blades to propel it forward faster than a typical quadcopter. The video depicts the first prototype flying tethered. The annular wing (or ring) has a flat airfoil shape, which also covers the propellers and enhances human safety. These autonomous controlled flights help extract aerodynamic properties of the vehicle. A lift to drag ratio (which is a metric for aerodynamic efficiency) of 12 is achieved for the ring only. The total vehicle lift to drag ratio is lower, but can be substantially improved upon with an optimized design. Further details will be submitted to a future conference or research journal. In terms of structure, the vehicle is a standard quadrotor configuration. It has depron foam sheet attached via zip ties to the four motor mount arms, with black carbon slab wrapped around the foam. This research was funded in part by the National Research Council of Canada (NSERC) and the Swiss National Science Foundation (SNSF).